I had a good weekend not doing much work except for playing around with my gentoo box adding some eye candy for a sexier desktop. It all started on Saturday when I woke up in the morning and suddenly decided I wasn't going for classes. Instead I opt to goto Expograhics to pick up some books. Its been a while since I've went book shopping as reflected by the 5,500/= bill! Oh well more books to my collection that I would read some day when I'm old and retired (good thing that linux books don't become obsolete). Anyway after a tiring day walking around fort and carrying a ton of books, I came home just dozed off for about two hours. 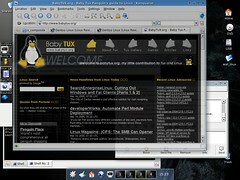 After a good rest and feeling a little better I started researching for an article I am writing on Linux and Hardware. Soon I was distracted and was searching to get 3D acceleration working on my IGP 340 graphic card that came on my notebook. I had this working some time back on Xfree86 4.3.99 using a 3rd party patch, but now that I was on Gentoo it used xorg instead. After some googling it was evident that my card was already officially supported by the xorg server. All I had to do was to emerge x11-drm && opengl-update. 3D performance wasn't all that awesome! It was at a disappointing below 400 fps. May be I can tweak it further to squeeze some more fps out of it but will have to wait and see. For now that seemed good enough to run all those opengl screen savers :) Next I installed the 3ddesk package that can be used to switch between virtual desktops. 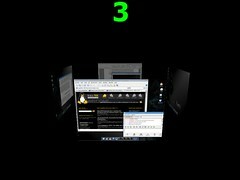 I set a shortcut Ctrl+Alt+3 to run the 3ddesk when I need to switch. Next I wanted to try out the experimental composite support on xorg that allows you to get some further eyecandy effects such as drop down shadows and translucency! Lucky for me I found a good article on that. I set a short cut Ctrl+Alt+T, so that I can click on any window to make it transparent.